Known for enormous-scale displays, elaborate gardens and over-the-top floral creations, the Philadelphia Flower Show brightens the dull days of March. This year, the show takes on a theme big enough to match its reputation: a tribute to the centennial of the National Park Service. One of the first anniversary celebrations of the year, the Philly show is sure to be spectacular. No less could be expected from the world’s largest indoor horticultural event and the largest flower show in the United States. As chief of Shows & Events for the Pennsylvania Horticultural Society, Sam Lemheney has a big title and an even bigger responsibility—directing the planning and creation of the Society’s major events including the Philadelphia Flower Show. But it’s a job he’s been raised for. His grandfather owned a landscape nursery and his father operated his own flower shop. When managing the Epcot International Flower & Garden Festival, Lemheney chaneled the talents and energy of Disney’s horticultural staff into a transformation of the gardens into one of the country’s most exciting flower and garden events. 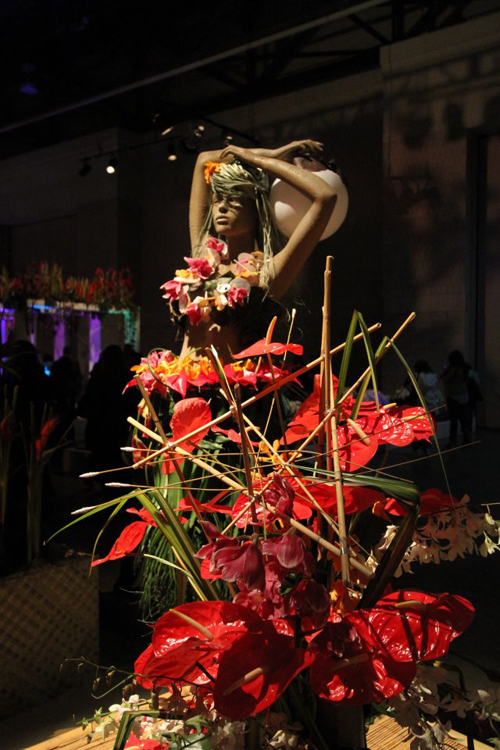 And who can forget the illuminated Eiffel Tower his team created for the 2011 Philadelphia Flower Show, “Springtime in Paris.” Or the 2012 show’s spectacular entrance to “Hawaii: Islands of Aloha.” The entrance is the show’s biggest attention getter and this year is no exception. “When we thought about the magnitude of the national parks, we realized that there was no way to recreate that experience in a 300,000-square-foot exhibition space, so rather than create a mini version, we have chosen to put visitors at the start of a typical visit to a national park, which in many cases is through a ranger station or one of the magnificent timber lodges such as those in Yosemite or Yellowstone,” says Lemheney, who reveals that visitors will find “an open-air/portico feel with ferns and early spring bulbs as well as a 14-foot waterfall; the 90-foot diameter pavilion has projections of amazing views of parks overhead.” Think of the spectacular sights of Arches, Yosemite, Grand Canyon, Yellowstone and you’ll get the idea. From there, visitors are invited to explore the displays created by individual designers inspired by the nation’s great parks. In the nineteen sixties, the emphasis turned from saving great and wonderful scenery and unique natural features to making the parks accessible to the public. Since the inception of the Park Service, the number of national parks has grown to 59. While the theme selection process begins with Lemheney, who maintains a list of possibilities—a sort of wish list of concepts he’d like to work on—he acknowledges that it’s not entirely an outlet for his personal creativity. “Part of my responsibility is to attract people to horticulture and so I have to take the interests of the general public into account as well as picking themes that are a good fit for horticulture,” he says. In selecting a theme, Lemheney works with the Pennsylvania Horticultural Society (PHS) marketing team for what is the Society’s major fundraising event. 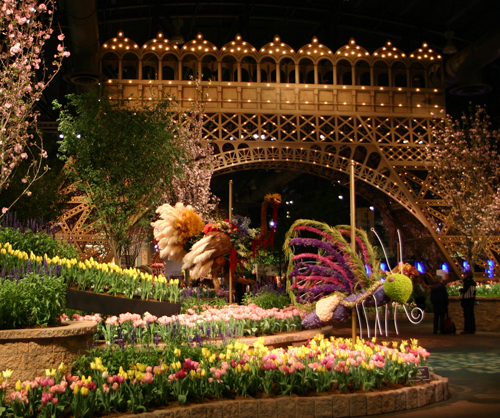 The Philadelphia Flower Show has been running since 1827, when PHS was founded. The society’s motto is “planting seeds, growing lives” and also runs “Philadelphia Green,” an urban greening program promoting improvements in the urban landscape and acknowledging efforts across the state with an annual Community Greening Award. This year’s theme was conceived two years ago. It was a “no brainer,” a great fit for the entire show, which is expected to draw a quarter of a million visitors over the course of its nine-day run. Such numbers have been typical since the show moved to the Convention Center in 1996. That inaugural event drew a whopping 318,000; since then the number has been in the range of 220,000 to 270,000, says Lemheney. While some years the show has had no particular theme, recent years have been focused. 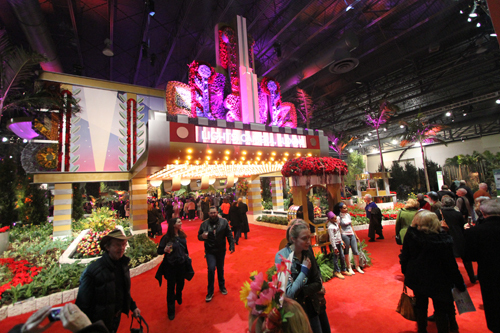 Last year’s displays were inspired by “The Movies.” In addition to the abovementioned Paris and Hawaii, earlier years have taken inspiration from agriculture, Italy, jazz, Ireland, great gardeners of the world, and hometown USA. Major show participants have been working on this year’s theme since receiving a heads up some 14 months prior to the event. There are between 35 and 50 major landscape and floral exhibitors as well as some 150 in the competition class and five to six hundred plant competitors. After all, this is still a good old-fashioned flower show with plants being judged and ribbons and medals vied for. The approximately 200 judges, all of whom are volunteers from across the country, are experienced horticulturists, landscape architects, flower arrangers, and designers. About 60 major awards are given out and judging occurs daily. Lemheney, who is expert in growing annuals, container gardens, and greenhouse/forcing plants, serves as a judge for premier flower shows in Singapore, Japan and South Korea, and has judged the floats at Pasadena’s Tournament of Roses Parade. Asked about his own favorite parks, Lemheney says that while he can’t claim to have seen them all, he has an affinity for majestic trees. Besides the Grand Canyon, he favors the redwood forests of the Muir Woods National Monument, named for the Scottish-American naturalist John Muir (1838–1914), the Sierra Club founder. Muir, who is known as the “Father of the National Parks,” petitioned Congress for the bill (passed in 1890) that established Yosemite National Park. Besides being “wowed” by the show’s entrance, visitors will be delighted, says Lemheney, by “the creative ways in which individual competitors interpret rather than imitate nature in their floral extravaganzas.” Particularly exciting, he suggests, will be the AMTRAK-sponsored miniature train garden in the show’s satellite activity area, which will present a journey through many different national park landscapes, as created by the Train Garden Association using Bachmann Model Trains. Show week begins with an exclusive and elegant black-tie Preview Party on Friday, March 4, from 6 to 11pm. “This is always a great experience,” says Lemheney, noting that in recent years the event takes place on the show floor where partygoers can enjoy food and beverages among the exhibits. For the first time, this year, the evening is being extended to 11pm rather than ending at 9pm as in earlier years. The show is open to the public Saturday, March 5, from 11am to 9pm; Sunday, March 6, from 8am to 9pm; Monday through Friday, March 7 to 11, from 10am to 9pm; Saturday, March 12, from 8am to 9pm; and Sunday, March 13, from 8am to 6pm. PHS member previews take place Friday, March 4, from noon to 3:30pm and Saturday, March 5, from 8 to 11am. The Philadephia Flower Show takes place at the Pennsylvania Convention Center at 12th & Arch Streets in Center City Philadelphia (PA 19107), which is the main entrance and ticket office, but you can also enter the show on Market Street between 11th & 12th Streets (via Jefferson Station). Besides the horticultural aspect, the nine-day show offers live entertainment, culinary demonstrations, gardening how-to workshops, and lectures by experts as well as special events and products and services related to floriculture and horticulture. And if you’ve ever wondered what happens to all those gorgeous plants when the show comes to an end, cut flowers are most often reused or donated by the exhibitors who will save uncut growing plants for future exhibitions. Show Management prohibits the public from taking and/or purchasing exhibit plants from the Convention Center. For more information on the Pennsylvania Horticultural Society (PHS), 100 N. 20th Street, 5th floor, Philadelphia, PA 19103, visit: www.pennsylvaniahorticulturalsociety.org. For more on the National Park Service, visit: www.NPS.gov.